I don't have to travel far from home to be rewarded with stunning wildlife. Yesterday was a perfect example. Just 1.5 miles from my home, I came across this scene of 3 bald eagles arguing over a deer carcass. I was able to watch them interact (and feast) for over 30 minutes. Always mindful to keep my distance so I don't interfere with an animal's natural behavior, I stayed in my car observing intently. It was also fun to watch a couple of eagles flying back and forth among the distant pines waiting for their turn. As I was headed home several hours later, I passed close to the same spot and saw 2 pheasant roosters. What stunning color they have this time of year. This is a good reminder for me to have my camera with me especially this time of year. I didn't have it when I first spotted the eagles so had to run back home for it. (and that 1.5 miles is a steep climb in slushy snow and ice. Good thing I have 4-wheel drive to get to my home!) The rest of the day proved fruitful. I also saw large flocks of Canada geese feeding on freshly sprung winter wheat, a flock of trumpeter swans in flight, deer, strutting tom turkeys, several prairie falcons, numerous mallard pairs, and a kestrel. And I wasn't trying to have wildlife encounters. Just running a couple errands. How I love the arrival of Spring. Original Oil painting by Linda Besse 14" X 23"
Sometimes I have the title in my mind before I start and other times I am struggling to come up with one after I am finished. This time, the title came to me while I was working on the painting at the Tulsa show. After running a couple of other title ideas past a few of my artist friends (who thought they were awful! ), I landed on the title which I think says it all. 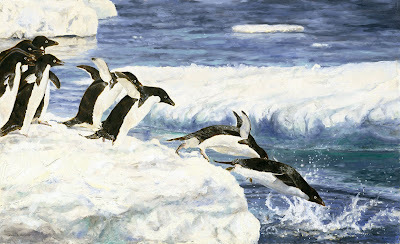 While working on the painting, I was thinking of the Antarctic Polar Plunge I did on the trip. (hence the title.) Yes, the re were 40 of us out of the roughly 100 passengers who engaged in this perfectly insane endeavor. Though not as graceful as the penguins, I certainly tried to make up for it with enthusiasm. The photo of me is just after my feet leave the platform and before I am engulfed in iceberg-laden water! Brrrrrr! While the leaping penguin painting in Evolution of a Painting was in transit to the NatureWorks show in Tulsa (see blog below), I completed two other penguin paintings. 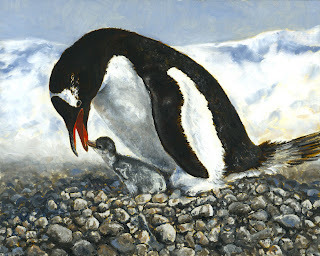 There are few scenes more touching than a penguin with its chick. I find the gentoo penguin with its red beak and white eyebrow one of most attractive of its species. Even at this young age, the chick is starting to show the tell-tale hint of a red beak. I wanted this to be one of the first scenes I painted on my return from Antarctica. The first morning on shore, brilliant sunlight made the ice floes glow. I wanted to capture the nuances of the colors in the ice and the endearing character of the Adele penguins. The successful colony had tens of thousands of breeding pairs. 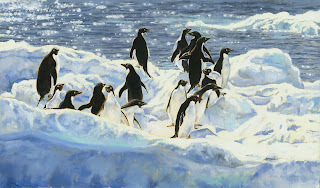 I like painting miniature paintings, and when finished with Penguin Party, I had to paint my signature. The last e of my name took 5 times to get right because it was so small. I had to wonder if maybe I had taken the concept of "miniature" a tad too far! 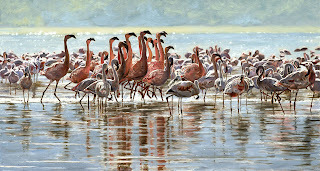 At NatureWorks, I received an Award of Excellence for my painting, Flamingo Dance. With all the great work at the show from the other artists, I consider the award quite an honor.